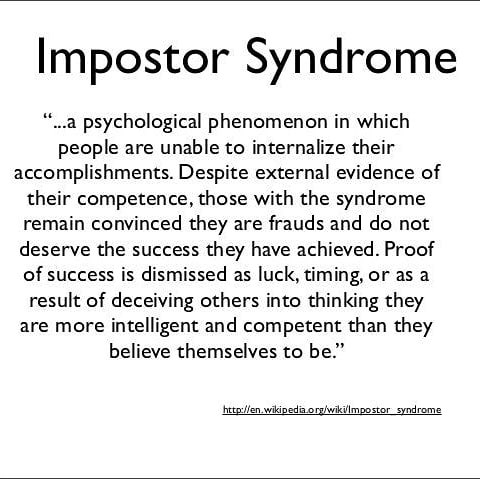 Impostor Phenomenon is a term coined by Dr. Pauline Clance and is more commonly known as Impostor Syndrome. Individuals that suffer from Impostor Syndrome are usually high achievers in some facet of their life, whether it be career in their, in education, or in the arts. What I have found in working with individuals that struggle with impostorism, is that that they don’t come to therapy indicating feeling like an impostor as their primary presenting problem. Most often they’ll express feelings of not living to their full potential or report a history of self-sabotaging their success. In addition, while Impostor Syndrome isn’t in the Diagnostic and Statistical Manual of Mental Disorders Fifth Edition (DSM-5), the symptoms usually develop into depression or anxiety, disorders that are diagnosable. They had a parent(s) that was very critical of them; frequently pointing out where they needed improvement. Their parent(s) did not equally provide praise of their accomplishments or achievements, and often dismissed those accolades as routine or required. They are often the product of a childhood environment that was dysfunctional, in which they seem to be the only person from their immediate family to have experienced the overall success they have achieved. Expressions of love were infrequent or nonexistent. As adults they seem to be the “only one” in the room, as in the only person of color or only woman. As a result of these experiences they have developed a high level of self-doubt, are dismissive of their own abilities, are overly critical of themselves, neglectful of their needs, and fearful of future failure. For example, someone struggling with Impostor Syndrome might receive an award and say, “Oh, almost everyone got one,” or after getting an ‘A’ in a class, they might respond, “That class was easy!” Other times they may be plagued with intense fear that they are going to “screw things up” as a result of getting a promotion, becoming a parent, approaching marriage, or some other potential increase in responsibility. Therapy is focused on teaching them how to rewrite the negative narrative they have adopted about themselves. The goal is to allow them to connect with the reality of their abilities and accomplishments, so that they can experience life impostor free. I’m disappointed at times in my present accomplishments and think I should have accomplished much more. I’m often afraid that I may fail at a new assignment or undertaking even though I generally do well at what I attempt.